As soon as the team disembarked from the terminal they were jumped upon by a band of warriors cladonly in traditional battle wear. A ceremonial payment of Malaitan shell-money, Tafuliae, was presented to the leader symbolising their acceptance by the host community. From there on proceedings were a lot more cordial as the formal welcome was offered by president of Solomon Warriors, Hon. Bodo Detke during the press conference that followed. “On behalf of the club I would like to welcome Erakor Golden Star team to Honiara. We really look forward to having the friendly matches and we hope for a good test for our boys,” Hon. Detke said. In reply the president of Erakor Golden Star, Charles Carlo, thanked Solomon Warriors for the welcome and offered his club’s best for the friendly matches. “We also are warriors and we would like to give your team good test matches as you prepare for your upcoming international matches. Thank you very much for the warm welcome,” Carlo said. Erakor Golden Star are on a one week tour of Honiara courtesy of Solomon Warriors who are preparing for the Oceania Football Confederation (OFC) Champions League later this year. The two clubs will play three friendly matches on Monday, Wednesday and Friday this week. In what is good news for local football fans three of Erakor Golden Star’s top players Jean, Tony and Brian – all sharing the same surname Kaltack, are on this tour. The Kaltack trio are popular among fans in Honiara and many are expected to turn up to watch them in action. The tour is sponsored by Solomon Warriors in association with its partners ITA Hardware and Didao Service Station. The friendly matches are organised in collaboration with the Solomon Islands Football Federation (SIFF). 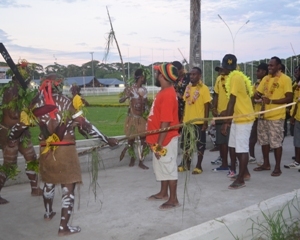 Last week Solomon Warriors and Erakor Golden Star sealed a trans-national football relationship by becoming sister clubs with a traditional ceremony in Erakor on Efate island in Vanuatu. In a sign of friendship Hon. Detke was presented a traditional tamtam by Erakor chief Kaoruk Lalien.